In the second part of this series we commemorate additional Royal Navy vessels that visited Pitcairn and contributed to improving the life of resident Pitcairners. From providing medical services and judicial duties, to even providing a source of names for new born children, the ships have become part of Pitcairn’s history. 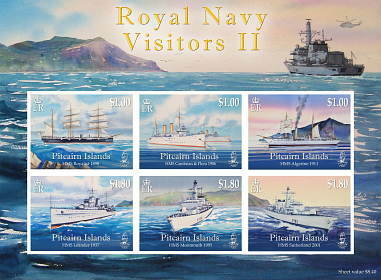 This issue highlights six more vessels that visited between 1898 and 2001 and have not previously appeared in a Pitcairn stamp issue. HMS Royalist – built in 1883, She was chosen to convey a judicial commission to Pitcairn in 1898. The mission was to conduct the trial of Harry Albert Christian for wilful murder of Julia Warren and her child who Christian fathered. Found guilty, he was taken aboard the Royalist in irons and hung that same year in Korovou Gaol, Fiji. HMS Cambrian and Flora – these 2nd class cruisers stopped off at Pitcairn in 1906 and during their five day visit, a torpedo party blasted a boat passage in Bounty Bay. When Millie Flora Coffin was born in 1907 she carried on the tradition of some island children being given names which commemorated naval visits. 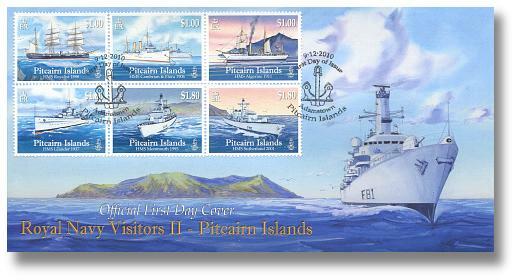 Both ships revisited Pitcairn in 1909. HMS Algerine – carrying both sail and steam this sloop was built in 1895 and visited Pitcairn in 1911 and 1913. Her second visit was more beneficial to the Islanders when Henderson island was reviewed, the inhabitants of Pitcairn island were documented and photographed and the ship’s surgeon checked all for disease. None was found. HMS Leander – this light cruiser was launched in 1931 and acquired by New Zealand on loan. En-route to NZ she visited all four islands of the Pitcairn group and her visits were highlighted by the use of her amphibious Walrus aircraft. The plane took aerial photographs to investigate possible flying boat and landplane bases for a projected trans-Pacific extension of Imperial Airways Far East route. The Leander landed a shore party on each of the uninhabited islands and mounted a Union Jack and noticeboard proclaiming British sovereignty. HMS Monmouth – nicknamed the “Black Duke”, the frigate Monmouth arrived at Pitcairn on 28 May 1995 and, with the RFA Brambleleaf stayed for two days. The Monmouth’s helicopter was put to good use ferrying officials. The Island’s Miscellany newspaper reported: “The day dawned grey, overcast and wet.........'they (the visiting dignitaries) were arriving by helicopter from the Monmouth and the "fly by" performed by the pilot was spectacular to say the least".......Nigel, the (ship's) dentist and Ian, his assistant, consulted with almost every person on Pitcairn. They then proceeded to fill, extract and mould for the entire length of their visit”. HMS Sutherland – launched in 1996, this Type 23 frigate visited Pitcairn in 2001 carrying the Governor of Pitcairn, Martin Williams and his wife Sue. Together with the RFA Bayleaf, the Sutherland made a two day visit enabling the Governor to attend official engagements. 9 December 2010 for a period of 2 years. Acknowledgement: The Pitcairn Islands Philatelic Bureau would like to recognise the invaluable help of Graham Ford and Herb Ford in making this issue possible.